CAPE GIRARDEAU, MO. — Olympic softball star, Jennie Finch, will be the keynote speaker at the Semoball Awards on July 11 at the Southeast Missouri State River Campus. The three-time All-American pitcher at Arizona was announced as the speaker for the second annual event on March 4, 2015 at HealthPoint Fitness in Cape Girardeau. Source: semissourian. 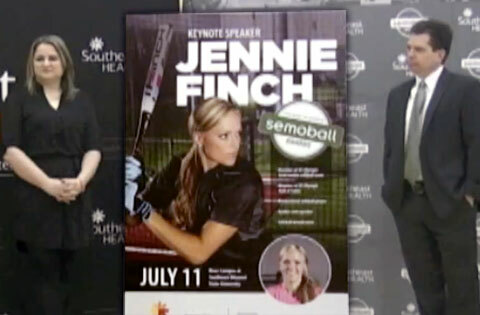 Watch Olympic champion Jennie Finch announced by Lucas Presson at HealthPoint Fitness as the keynote speaker for the Semoball Awards to be held July 11, 2015 at the Southeast Missouri State University River Campus in Cape Girardeau. The Semoball Awards honors more than 200 athletes from 57 high schools in the region. A player of the year from each sport will be revealed as well as the coach of the year, female and male athlete of the year, female and male scholar-athlete of the year, sportsmanship award winner, comeback player of the year and lifetime achievement award winner. Jennie Finch is an Olympic Gold medalist and former American softball player who pitched for the USA national softball team and the Chicago Bandits. She helped lead Team USA to the gold medal at the 2004 Summer Olympics and a silver medal at the 2008 Summer Olympics. She is also a devout Christian who speaks about her faith in God. Playing Field Promotions is a booking agent for motivational sports speakers and celebrities. If you would like to book pro athletes like Jennie Finch for a speaking engagement, personal appearance or special event, you can request Jennie Finch agent and speaker information from PFP Sports & Celebrity Talent or call 800.966.1380.